1In a medium skillet, heat a drizzle of oil and dab (about a tablespoon?) of butter over medium-high heat. Saute the onion for a few minutes, until soft; add the garlic and curry powder and cook for another minute. Add the frozen peas, cherry tomatoes and the insides of the potatoes, scooped out into the pan; cook for a few minutes, until the peas are heated through, tomatoes have wilted and everything is coated with curry and browned bits. Season with salt and pepper. 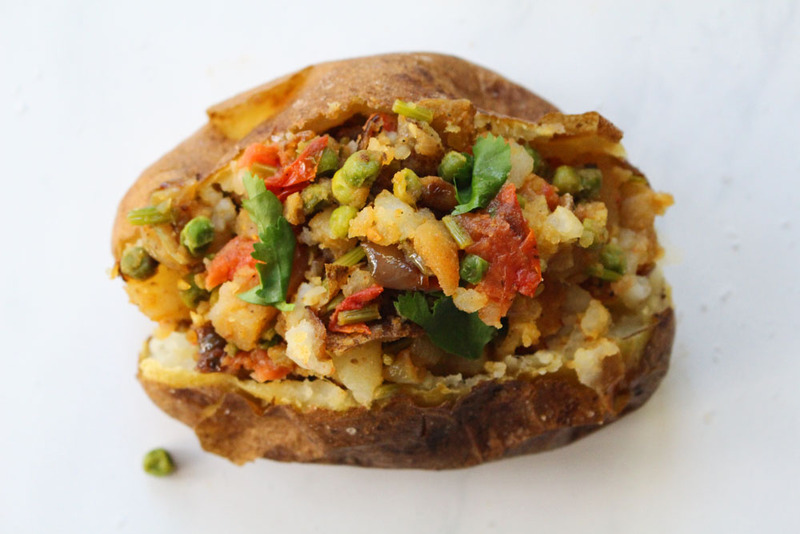 2Pile back into the baked potato shell and serve immediately, topped with a dollop of plain yogurt and/or extra cilantro if you like.